A simple word, and as I've discovered recently, a very powerful word, a 'doing' word. Yes gets things done but has to be used wisely, as I have also started to appreciate. I spent last weekend doing things I love. Sleeping under canvas, OK it was in a gazebo, but it was in a field usually frequented by sheep. I was in a sleeping bag/bivvi combo on a camp bed, the nights were cold, but I was as warm as toast. I could sometimes hear fellow campers shuffling about in the dark, and even the crackling of the camp fire in the distance, bliss. I spent the weekend at the first ever Yestival, a celebration of Yesness, a field full of people who just want to make the world that little bit better. Fortunately, I didn't hear anyone screaming for help, as I was there in my role as an emergency medic, another thing I love doing. 'Work' thankfully was sparse, but enough to remind me why I was there, I think I was appreciated. It's difficult for me to call it work really, as I have always been a great believer in the saying that if you find a job you love, you'll never do another days work as long as you live. I love helping people, and training people how to help others. Saving lives is just the sharp end, thankfully one that I don't need to visit often, but people are often pleased to have me and my team around, just in case. Usually, as last weekend proved, I'm there for the bumped heads, and cut fingers. The occasional little something that found it's way into someone's eye, or even getting rid of public enemy number one, in this country at least, the tic. All pretty basic stuff, but it's about doing it well, and caring for the person you're helping. Not panicking when someone is laying on the floor in front of you, remembering all the time, that while it may be something simple to me, it may just be the worst day of their life so far, and they may be in pain, they may be worried, some even thinking the worst. I've seen far too many 'medics' who are clearly way under qualified when it comes to compassion, the actual 'caring' bit. It's not hard when you put your mind to it. Sometimes just holding someone's hand, or even giving them a hug, is really all that is needed, just enough to let them know that they are not alone, someone cares about them. Sometimes, turning up with a huge flash bag full of medical kit, has an adverse reaction. People see all the equipment and think that they must be sick, "if he needs all that stuff". Drugs can help of course. Not the ones the chemist dispenses, nor the illegal stuff (we'll have none of that), no I have a special set of drugs. Yes, there's paracetamol, aspirin, entonox, even a cylinder of good old oxygen resides in my boot when on duty. But I'm on about a very special set of drugs. Oxytocin-anandamide, or the lack of, has been shown to cause some of the poor social problems that autistic children have. Oxytocin is essential for social development and is known as the 'feel good' drug. (It's actually a hormone, but let's not get picky). It helps with parental and social bonding. It turns out that oxytocin might make social interactions more rewarding and pleasurable by stimulating our own cannabinoid system. That's the bit that reacts to one of those 'non-legal' drugs, cannabis. According to research, it does this by triggering the release of a wonderfully nicknamed chemical, the “bliss molecule” anandamide, so named because the brain receptors it activates lead to increased motivation and happiness. So where do you get this Oxytocin stuff? Do they sell it in Superdrug, do you need a prescription? No, nothing so grand. It's actually openly available to everyone. It's not nicknamed the love molecule, cuddle chemical or hug hormone for nothing you know. Like I said, it's a hormone, a naturally occurring chemical found in your own body. You can boost the amount available, and it's easy. Caring. Yes, show you care, hug someone, put your arm around the person and hug them. Go on, try it. It does work. Have you ever seen a crying child, suddenly calm down when they get a hug from Mum? See, this caring thing, in my case, being what I like to think is a good caring medic, is easy. 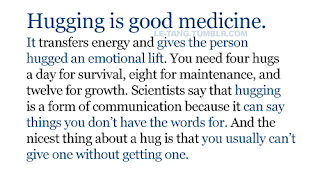 Yeah, you have to keep people breathing, stop bleeding, make sure the person is 'medically' ok but don't just do the paperwork and go, give them a hug, release that oxytocin. It's safe in large amounts too. Maybe the reason last weekend was so motivational, and everyone, without fail, was happy. You didn't have to look hard to find someone administering oxytocin. 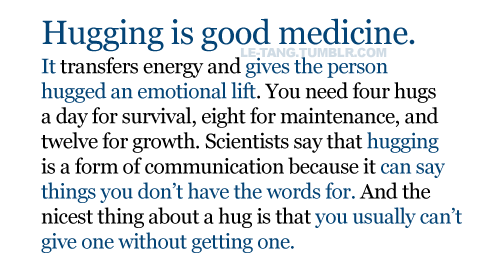 The cuddle chemical, the hug hormone. The saying is "Say Yes More" but try Hugging more too, like I need to tell you. 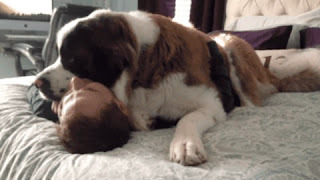 Why do you think we have BIG dogs in the Blethyn Basecamp?